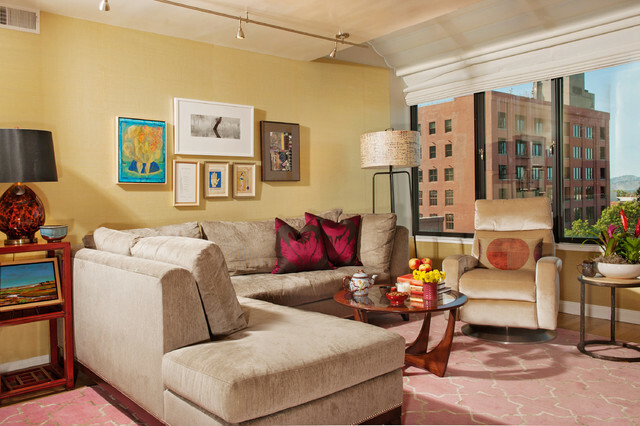 This condo serves as a family’s city apartment. It needs to meet many functions for many people as well as be colorful, comfortable and fun, not take itself too seriously. The gold half circle metallic banquette works for meals and reading the morning paper as well as small business meetings and a chic office space. Grey chenille sectional and cream velvet recliner are the neutrals sitting on a Madeline Weinrib pink silk/wool rug with magenta pillows and Chinese lacquered red accent pieces. TV or the view, huh?